“Swagatom”, meaning “warm greetings” is the philosophy at Babu Saheeb @ Ladywell Tandoori. Owners Habib and Khaleda have gained a well deserved reputation for quality food, excellent service and extremely affordable prices since opening in 1982. 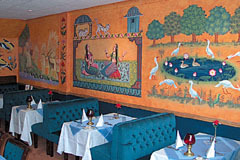 The new menu has introduced several new vegetarian and non-vegetarian dishes, including a range of game – pheasant, venison and duck - and fresh fish including trout, cod, pomphret and prawns, together with more traditional Indian favourites and the chef is pleased to prepare any dishes not on the menu. We now have a top chef, whose cooking is some of the best this restaurant has seen for some time. A new menu has been introduced which includes several new vegetarian and non-vegetarian dishes. Game specialities have also been introduced for the first time in our menu. We are continuing with our free offers on take-away and delivery orders which have been most welcome by all our customers. Whether you are eating in our restaurant or eating at home, may we wish you an enjoyable evening. Open Mon-Sat 5-11.30pm (closed Sunday). All major credit cards accepted. No service charge. Vegetarian and non-vegetarian Indian cuisine with game specialities. Quality food at affordable prices.